Uploading gives you the opportunity to upload and share files for free up to a size of 1024MB or 1GB and share them with everyone. What you can expect to earn is $10 for every 1000 downloads from United Kindom, Germany, France, Italy, Spain, Austria or USA, Canada; $5 for 1000 downloads from Russia, Holland, Greece; $2 for 1000 downloads from Poland, Ukraine and Czech Republic. And when you reach $30 or more you can request a payment by either Epese, Epassporte, Wire Transfer, Webmoney or PayPal which is the preferred method. With Easy-Share you’ll be able to upload and share your files and for every download you’ll earn ePoints which can then be converted into real cash. The maximum file size you can upload to Easy-Share is 200MB. You’ll earn ePoints each time someone downloads your files and you can make up to 2 ePoints per download, based on the origin country of the downloader. You get 2 ePoints for download from: Australia, Austria, Belgium, Canada, Denmark, Germany, Great Britain, Greece, France, Finland, Ireland, Italy, Netherlands, Norway, Portugal, Sweden, Spain, Singapore, Saudi Arabia and USA. You get 1 ePoint for download from: Brazil, Czech Republic, India, Japan, Malaysia, Mexica, Turkey, Poland, Russia and Ukraine. From every other download you get from another country you are going to get 0.1 ePoint. Then you can convert every 1000 ePoints you’ve earned for $1. The minimum is $10 to request payment with PayPal or ePassporte, minimum $50 for getting your payment trough WebMoney or minimum $500 for Wire Transfer. With SharingMatrix all you need to do is upload a file and place the URL received on your forum or blog web page, or on any other web pages where the user agreement permits you to put links fo your files. The maximum file size is 1024MB or 1GB so you can upload pretty much evetything that is legal of course. With SharingMatrix you can earn up to 30$ for every unique 1000 downloads made from visitors of the following countries: USA, Canada, Great Britain, Australia, Germany, Austria, Spain, Swiss, Belgium, Holland, France, Italy, Russia, Ireland, Norway, Sweden and Finland. For 1 file with size of 1-100MB you’ll earn $5 for 1000 downloads, for files with size of 101-250MB you’ll get $10 for 1000 downloads and for files of 251MB or over you get $15. The payment period is every 2 weeks with a minimal payment of $30 and you can receive your money only trough PayPal. 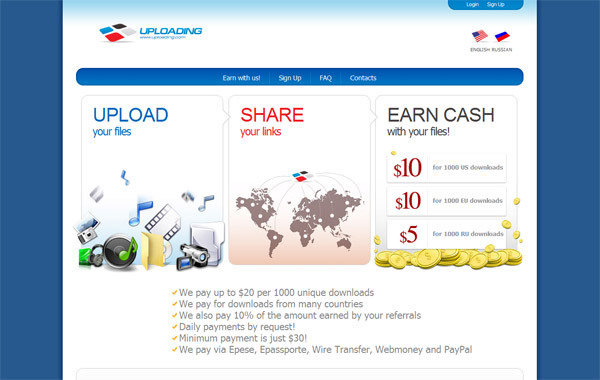 Expect information about more such free uploading services the moment I’m able to try them. I believe that the preferred method for getting payed from the above services is PayPal, so if you still don’t have an account you can create your PayPal account here.